"Pohono Bridge in Yosemite" The Pohono Bridge is one of my favorite bridges in Yosemite National Park. It marks my entrance into Yosemite as I come across that and visit Fern Springs. I could put my chair here and read a book and never leave this spot! 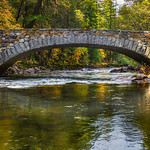 This image captures the essence of those stone bridges over the Merced river with fall colors surrounding. The reflections of the trees glow yellow and green on the river. Where are some of your favorite spots to just relax in Yosemite?! This is a 9 image high-resolution panorama captured with the Canon EOS 5D Mark II at ISO 100, f/11and 1/4 shutter speed. The lens is the Canon 70-200mm f/2.8. Camera gear was courtesy of Jennifer Wu Photography and Canon USA in case you were wondering where this Nikon guy found this gear This print will will look fantastic on a wall in your home or office! Copyright John Harrison Photography — at Yosemite National Park. This is a 1:2 ratio panorama that will look fantastic on your walls! Either 20" x 40" or 24" x 48" or larger would be a great size. This panorama image is made to 50" x 100" or more.